A giant black hole in the center of the galaxy 4C+29.30 is generating two powerful jets of particles. By combining X-rays (blue), optical (gold), and radio (pink) data, astronomers get a full picture of what is happening. The X-rays reveal superheated gas swirling around the black hole, some of which may eventually be consumed by it. The black hole at the center of 4C+29.30 is thought to be about 100 million times more massive than our Sun. This composite image of a galaxy illustrates how the intense gravity of a supermassive black hole can be tapped to generate immense power. 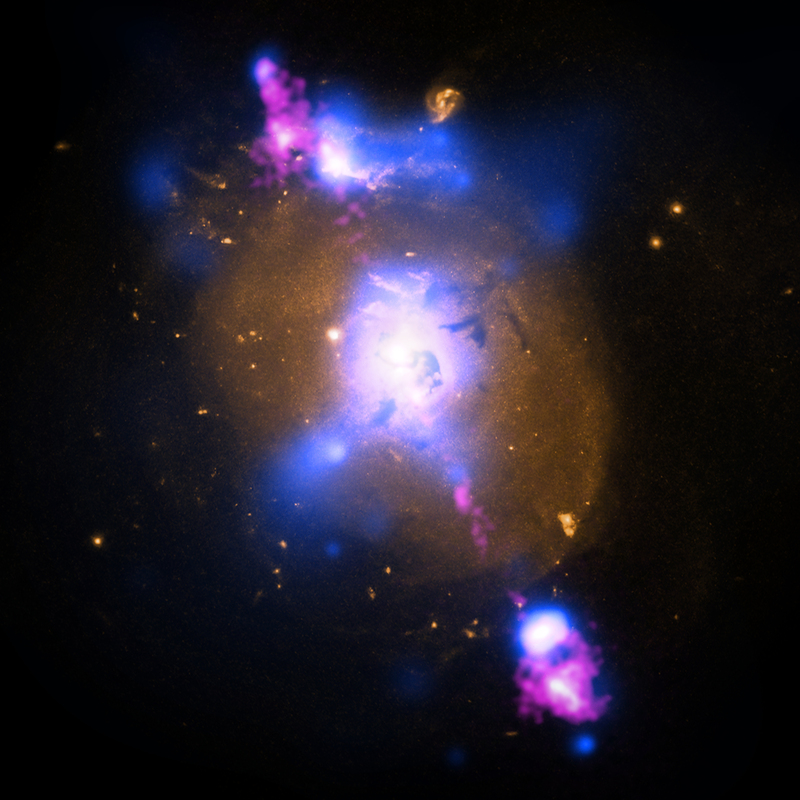 The image contains X-ray data from NASA's Chandra X-ray Observatory (blue), optical light obtained with the Hubble Space Telescope (gold) and radio waves from the NSF's Very Large Array (pink). The bright spots in X-ray and radio emission on the outer edges of the galaxy, near the ends of the jets, are caused by extremely high energy electrons following curved paths around magnetic field lines. 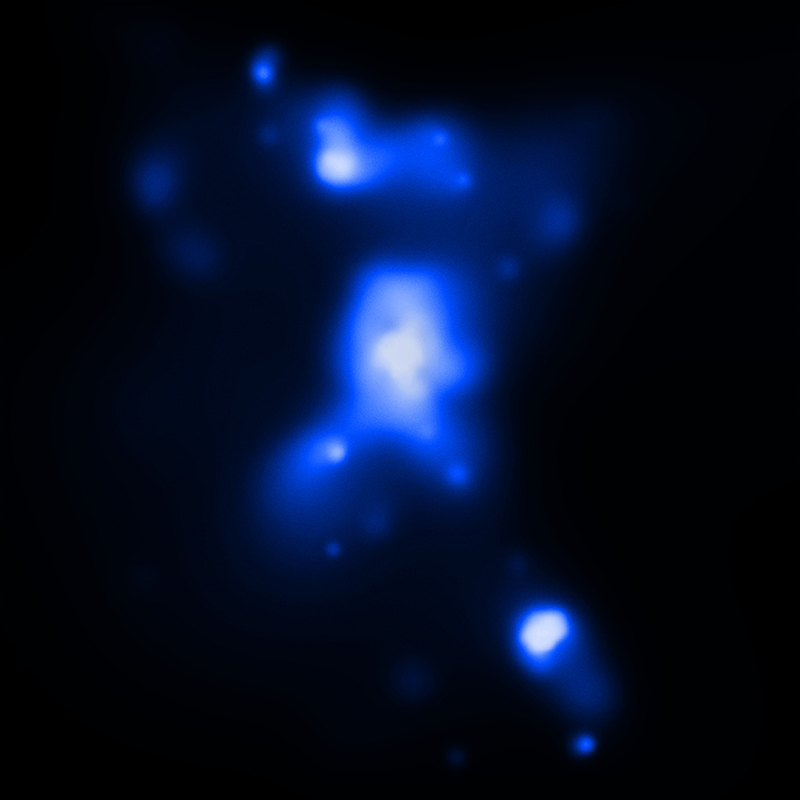 They show where a jet generated by the black hole has plowed into clumps of material in the galaxy (mouse over the image for the location of these bright spots). Much of the energy of the jet goes into heating the gas in these clumps, and some of it goes into dragging cool gas along the direction of the jet. Both the heating and the dragging can limit the fuel supply for the supermassive black hole, leading to temporary starvation and stopping its growth. This feedback process is thought to cause the observed correlation between the mass of the supermassive black hole and the combined mass of the stars in the central region or bulge of a galaxy. These results were reported in two different papers. The first, which concentrated on the effects of the jets on the galaxy, is available online and was published in the May 10, 2012 issue of The Astrophysical Journal. It is led by Aneta Siemiginowska from the Harvard-Smithsonian Center for Astrophysics (CfA) in Cambridge, MA and the co-authors are Lukasz Stawarz, from the Institute of Space and Astronautical Science in Yoshinodai, Japan; Teddy Cheung from the National Academy of Sciences in Washington, DC; Thomas Aldcroft from CfA; Jill Bechtold from University of Arizona in Tucson, AZ; Douglas Burke from CfA; Daniel Evans from CfA; Joanna Holt from Leiden University in Leiden, The Netherlands; Marek Jamrozy from Jagiellonian University in Krakow, Poland; and Giulia Migliori from CfA. The second, which concentrated on the supermassive black hole, is available online and was published in the October 20, 2012 issue of The Astrophysical Journal. It is led by Malgorzata Sobolewska from CfA, and the co-authors are Aneta Siemiginowska, Giulia Migliori, Lukasz Stawarz, Marek Jamrozy, Daniel Evans, and Teddy Cheung. Coordinates (J2000) RA 08h 40m 02.40s | Dec 29° 49´ 02.60"
You must be very proud about your work. It is about knowledge, discoveries, expanding frontiers. Great.... Science Spread his wings to Universe .... Research Methodology should available to Student so they will encourage for choose this as career .... Thanks to Indian Scientist to give us such wonderful fact. Astronomy is my great hobby; all the new researches in this sphere are always interesting but Harvard University recent photos are especially important and amazing. A galaxy located some 850 million light years from Earth. About 850 million light years from Earth. Combining X-rays from Chandra with optical data from the Hubble Space Telescope and radio waves from the NSF's Very Large Array (pink). About 180,000 light years across. X-rays are blue, optical yellow and radio pink. In the constellation Cancer, visible in the Northern and Southern Hemispheres.